Julie Arguinzoni, co-founder of Victory Outreach International has a tremendous burden to see women from all walks of life rise up to the call of God and find their place in ministry. From a tiny handful of women, United Women in Ministry has grown and blossomed into what is now an international women’s movement. Monday, March 11th @ 7:00 p.m. & Tuesday, March 12th @ 9:00 a.m. TRANSLATION: Spanish translation provided at every General Session. Stay in touch. Sign up to receive Victory Outreach e-News! Please provide all information required below. At Victory Outreach International, we respect and protect the privacy of our members and those who use our websites, products and services. This privacy statement provides details about how your personal information is collected and used. Personal information is any information that identifies you or would enable someone to contact you, such as your name, email address, phone number and other non-public information that is associated with such information. This privacy statement applies to the Victory Outreach International websites, victoryoutreach.org, uwc.victoryoutreach.org, myvoi.org, r4h.victoryoutreach.org, events.victoryoutreach.org, treasurestv.org domains and any other sites owned or operated by Victory Outreach International (the "Sites"). 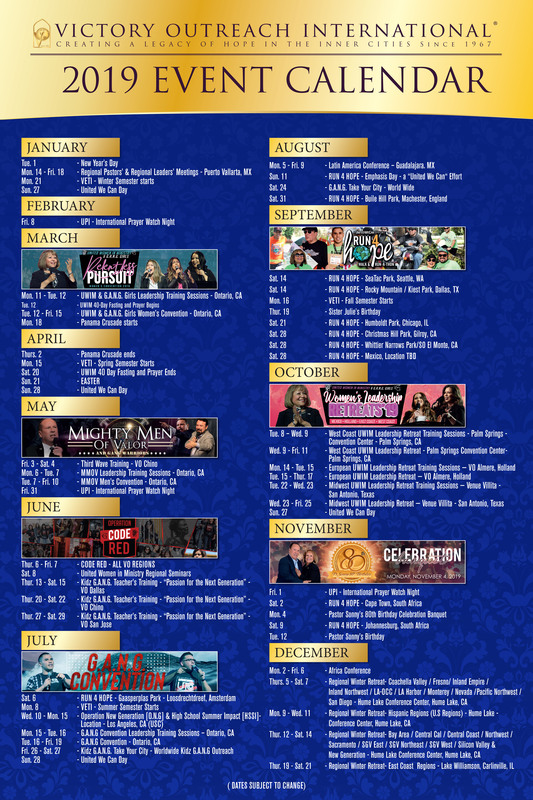 Victory Outreach International is located at 250 West Arrow Highway, San Dimas, CA 91773. © 2013 - 2019 Copyright Victory Outreach International.